EDGEMOOR, Del. 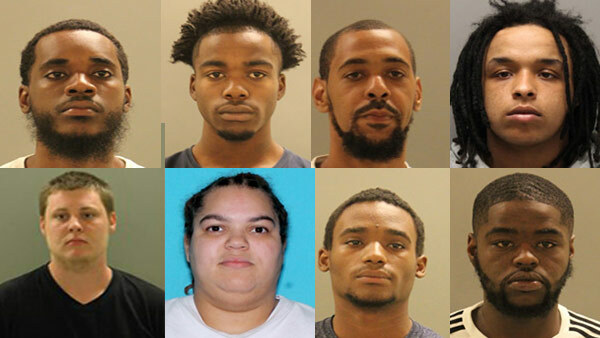 (WPVI) -- Authorities in New Castle County have announced nearly a dozen arrests in connection with alleged drug and gang activity in Edgemoor, Delaware. Eight adults and three juveniles were taken into custody during simultaneous raids on October 18. It was the culmination of an investigation that began in July. Police say the raids, targeting the Exit 4/Mag Boys Gang and other gangs, resulted in the seizure of heroin, marijuana packaged for sale, marijuana plants, miscellaneous drug paraphernalia, ammunition, US currency, gang clothing, and other gang-related material. Damon Owens (27, New Castle) was charged with Gang Participation, Drug Dealing, Possession of a Firearm by a Prohibited Person, Possession of a Firearm During the Commission of a Felony and Conspiracy. Damon Owens was held at Howard Young Correctional Institution for failing to post $38,000 cash bail. Stephen Jackson (19, Wilmington) was charged with felony Gang Participation and felony Drug Dealing. Stephen Jackson was held at Howard Young Correctional Institution for failing to post $8,000 cash bail. Treasure Parson (18, Wilmington) was charged with felony Gang Participation, and felony Drug Dealing. Treasure Parson was held at Howard Young Correctional Institution for failing to post $48,000 cash bail. Donte Richardson (18, Wilmington) was charged with felony Gang Participation, and two charges of felony Drug Dealing. Donte Richardson was held at Howard Young Correctional Institution for failing to post $13,000 cash bail. Deja Warner (28, Claymont) was charged with felony Gang Participation and felony Drug Dealing. Deja Warner was released on 8,000 unsecured bail. Khyon Bailey (25, Wilmington) was charged with felony Gang Participation and felony Drug Dealing. Khyon Bailey was held at Howard Young Correctional Institution for failing to post $13,000 cash bail. Keshon Phipps (20, Wilmington) was charged with three counts of felony Drug Dealing. Keshon Phipps was held at Howard Young Correctional Institution after failing to post $18,000 cash bail. Jason Gildersleeve (20, New Castle) was charged with felony Gang Participation, and two charges of felony Drug Dealing. Jason Gildersleeve was held at Howard Young Correctional Institution for failing to post $110,000 cash bail. In addition, three juveniles were also arrested and charged as a result of the investigation. Police say the investigation is ongoing and that more arrests are expected.